This is a great time to view planets in the night sky. Four of the five naked-eye planets are visible right now and the fifth will be reappearing around the middle of the month. The night starts with Venus in the west, setting about two hours after sunset. It’s followed by Jupiter, Saturn, and Mars. Around August 20, Mercury should be visible in the eastern sky just before sunrise. What’s more, Mars is near opposition, its closest approach to the Earth. In fact, it’s the closest Mars has been to the Earth since 2003 and it’ll be 17 years before Mars is this close again. Although I operate two large telescopes for the National Observatory, I don’t get many opportunities to look at just anything I’d like. Most of the time, if I want to look at planets, I need to do so with my old reliable 8-inch Celestron telescope in my backyard. 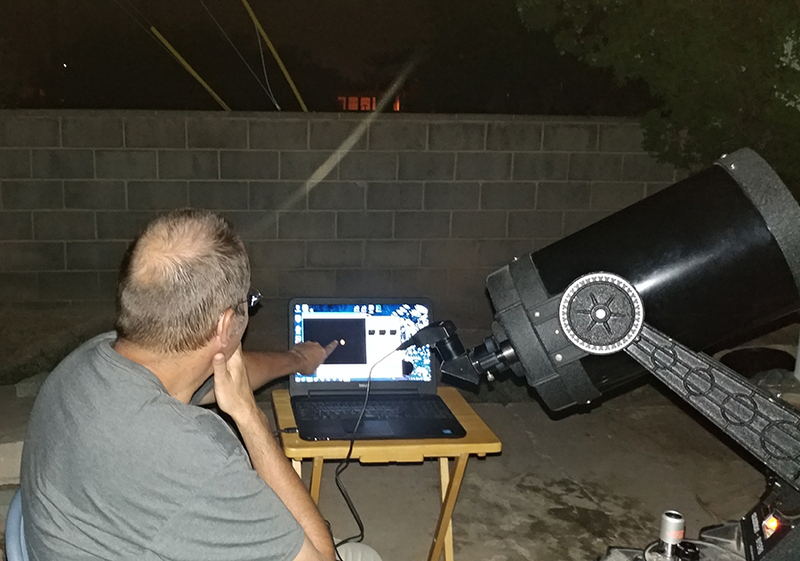 Fortunately, because this planetary show is happening in the summer and in the early evening, it’s actually pretty comfortable to sit outside with the telescope. Also, ever since my wife bought me an Orion Starshoot camera, I’m able to share my views with you. It’s monsoon season here in New Mexico, so that often means clouds in the evening. I missed getting any views of Venus, but I did manage to get images of Mars, Jupiter, and Saturn. This is especially fun, because they are also the planets the crew of the Solar Sail Aristarchus visits in my novel The Solar Sea. Each of the planet pictures below is shown at the same scale, so you get a sense for how big they appear relative to each other in my telescope’s eyepiece. Mars is the planet furthest in the east and the last of the three I observed. It was a little disappointing in that I didn’t see a lot of surface features. You can see one of the polar caps and some contrast between dark and light areas. Some of this is no doubt due to a planet-wide dust storm which has been engulfing the planet for the last month. I gather that dust storm is finally beginning to die down, so there’s a chance we’ll get better views later in the month while Mars is still close. In a way, this was kind of cool because one of the dangers the crew of the Aristarchus faced in The Solar Sea was a dust storm, albeit a somewhat more localized one than the planet is currently experiencing. Jupiter was quite lovely and helped to demonstrate that the seeing—the atmospheric stability—wasn’t the reason Mars was somewhat washed out. The very best view of Jupiter I’ve had is through the WIYN 3.5-meter telescope at Kitt Peak. It’s one of the few telescopes of that class with an eyepiece adapter, so I have had occasion to actually go out in the dome and look at objects through the telescope. 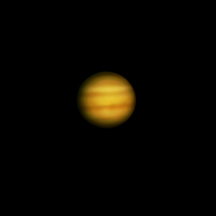 This is probably about the clearest I’ve seen the bands of Jupiter through my backyard telescope and I was pleased to see the great red spot. In The Solar Sea, the crew of the Aristarchus makes a point of flying over the red spot. It’s the largest, longest lasting storm in the solar system. If I went to Jupiter, I’d have to get close, though I wouldn’t want to be in it! Of course, the real star of the show, as it often is, was Saturn. This is by far the best photograph I’ve ever taken of Saturn. I was pleased to capture Cassini’s Division in the rings along with a band on the planet’s surface. 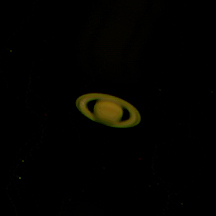 The only time I’ve ever seen Saturn better was when I had the opportunity to look through the 24-inch telescope at Lowell Observatory a couple of years ago. As it turns out, Saturn is the object of the quest in The Solar Sea. Thomas Quinn, who designs and builds the Aristarchus, discovers powerful particles near Saturn that appear to be able to travel through time. It turns out there’s more to these particles than meets the eye! On May 30, 2016, the planet Mars reached the point in its orbit where it’s closest to Earth. The two planets were 46.8 million miles apart. In about a week, Mars will grow noticeably fainter as the planets move away from each other. 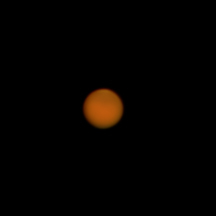 Earlier this week, on the night of June 6, I took advantage of the close approach to get a nice image of the red planet. This really illustrates why close approaches have been so important to understanding Mars. The improved resolution is breathtaking. During the close approach of Mars in the fall of 1877, Asaph Hall at the U.S. Naval Observatory discovered the red planet’s two small moons, Phobos and Deimos. That same close approach unfortunately led Italian astronomer Giovanni Schiaparelli to declare the existence of channels or even canals on Mars. American scholar Percival Lowell took the idea and ran with it, making a career of publishing studies of Martian canals and using them as proof of Martian life. What I like about this story is that although Lowell misinterpreted what he saw, his observations prompted critical thinking and led to a whole body of research. The modern Search for Extra-Terrestrial Inteligence, most certainly owes its existence to Alfred Russel Wallace pondering whether or not Martians really could build canals as Lowell claimed. Whether there are people on Mars or not, the planet captivates me and many other people. I’m not sure whether it’s the desert vistas, the prospect of a canyon that dwarfs the Grand Canyon, or a mountain that dwarfs Everest. 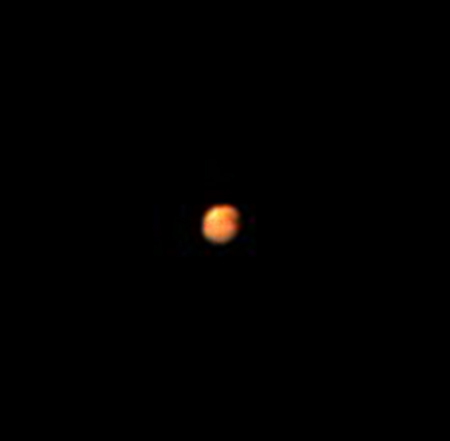 Perhaps its as simple as knowing that when Mars is at closest approach, it comes tantalizingly close to revealing its secrets even in an 8-inch telescope as in the photo above. I’ve been compelled to write about Mars on several occasions. The planet plays a prominent role in my novel The Solar Sea which you can read about at TheSolarSea.com. While there, you can check out some cool illustrations by Laura Givens and download a free reading guide. Also, my story “Arachne’s Stepchildren” appears in The Martian Anthology edited by David B. Riley. You can check it out at Amazon.com. Although Percival Lowell was wrong about Martian canals, his publications on the subject and the discussions that ensued helped to assure that Mars would be a real place in people’s imaginations in the years that followed. In much the same way, Kepler Project Scientist Steve Howell and I want to start viewing the planets discovered by the Kepler Space Probe with a similar sense of place. Because of that, we’ll start reading for the anthology Kepler’s Cowboys on Wednesday, June 15. Interested writers should click here for the guidelines. If you missed Mars’s close approach this time around, despair not! Mars will make an even closer approach around the end of July 2018. At that point it will only be 35.8 million miles from Earth and appear about a 30% larger than it did this year. I hope to be out with my telescope and camera to try to get another image of our fascinating planetary neighbor. 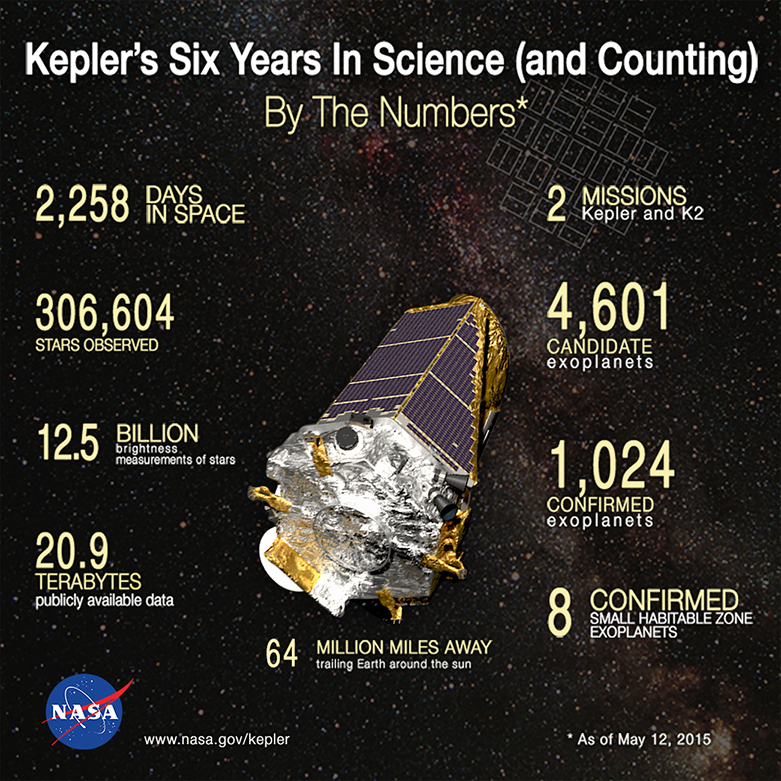 In March 2009, the Kepler space telescope was launched on a mission to monitor a section of our galaxy in order to see how many planets it could find. As the spacecraft has aged, it’s no longer able to point to one part of the sky. However, the science team was able to re-purpose the craft for a mission called K2, which is ongoing. A few weeks ago, it looked as though the craft’s life may have come to an end, but engineers were able to restore communication and the mission will continue. The graphic below is a year old, but it gives you a good idea of just how successful the mission has been so far. The graphic shows eight small planets in the habitable zone of their stars, but that only tells part of the story. Moons of giant planets in the habitable zone could harbor life and there could be exotic life on water worlds or in the atmospheres of gas giant planets like Jupiter. Steve Howell, Project Scientist for the Kepler Mission notes there are literally hundreds of planets in the habitable zones of their stars. In 2013, Steve and I collaborated to edit an anthology called A Kepler’s Dozen. 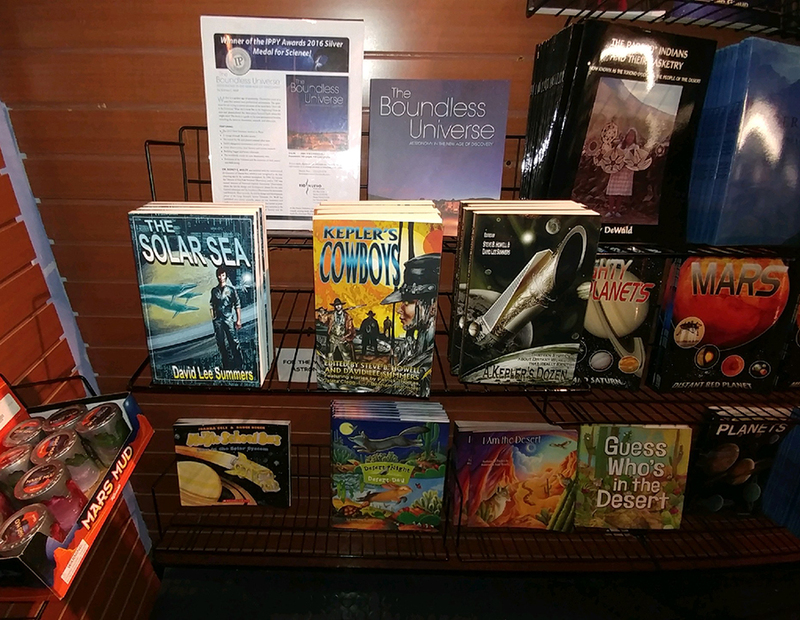 Our goal was to have a group of science fiction writers and astronomers write stories set on planets discovered by Kepler to bring them to life for people. Three years later, the number of planets has literally exploded and we find ourselves looking at a proverbial wild west. So, we want to continue exploring what Kepler’s worlds might be like by telling stories of the rugged men and women who either might explore those worlds, or might come exploring Earth from those worlds. The anthology is tentatively titled Kepler’s Cowboys and you can click here for the detailed guidelines. Submissions will open on June 15, 2016 and we’ll remain open until we’ve filled the anthology. We’re looking for stories about space cowboys—people like Captain Kirk and Lieutenant Uhura from Star Trek, Spike Spiegel and Faye Valentine from Cowboy Bebop, or Malcolm Reynolds and Zoe Washburne from Firefly—those brave, independent people who make a living among the stars. In the first anthology, we worked with the authors before they wrote their stories, helping them pick the planets. However, the frontier is now so vast that we’re changing the approach. This time, we’re challenging the writers to tell a great story involving a distant world in our galaxy without worrying about which Kepler planet it might be. If we choose the story, we’ll note in the story introduction, which Kepler planets are like the one or ones in the story. Also, note, this anthology will also be open to poetry. We’re excited to see where this will lead us. Steve has prepared an information page to inspire you and help you build realistic worlds based on those known to exist. If you would like to get a good idea of the editors’ tastes, the first anthology is available at Hadrosaur Productions and Amazon. A Kepler’s Dozen is an anthology of action-packed, mysterious, and humorous stories all based on real planets discovered by the NASA Kepler mission. 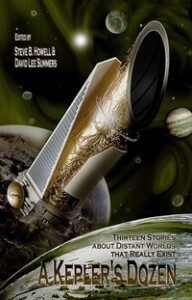 Kepler Project Scientist Steve B. Howell and I edited the anthology and contributed stories. Whether on a prison colony, in a fast escape from the authorities, or encircling a binary star, thirteen exoplanet stories written by authors such as Mike Brotherton, Laura Givens, and J Alan Erwine will amuse, frighten, and intrigue you while you share fantasy adventures among Kepler’s real-life planets. My anthology A Kepler’s Dozen: Thirteen Stories About Distant Worlds That Really Exist has just been released from Hadrosaur Productions. I co-edited the anthology with Steve B. Howell, the project scientist of NASA’s Kepler mission. Our goal was to have a set of astronomers and science fiction writers imagine what future explorers might find on the worlds discovered by the Kepler space probe. The tone of the stories range from light to serious, but the planets are always presented as realistically as possible. Fans of The Pirates of Sufiro will be pleased to know the book features an all new adventure with Captain Firebrandt and the crew of the Legacy. The National Optical Observatory wrote up a nice press release about the anthology which is available at http://www.noao.edu/news/2013/pr1305.php. The anthology is available at Amazon.com, BN.com, and Hadrosaur.com. Unfortunately, the book is released just as news comes out that the Kepler spacecraft has lost the second of four reaction wheels that allow it to point accurately. There’s a good chance this marks the end of the spacecraft’s ability to collect data. It’s important to remember, though, even if the probe stopped working immediately, there are still two years’ worth of data to sort through and many, many planets likely still to be discovered. The Kepler probe has been a phenomenal success and Steve Howell and I are already thinking about a second book that will explore even more of the Kepler planets! In the meantime, I’m gearing up for Phoenix Comicon which will be held over Memorial Day Weekend at the Phoenix Convention Center. This event is so big, it’s hard to know how to even begin describing it. All of the surviving cast of Babylon 5 will be there to celebrate the show’s 25th anniversary. There will be many other actors, comic artists, and writers on hand as well. I’m honored to be on several panels over the course of the weekend. Here’s my schedule. Noon-1pm – So You Wanna Be a Writer – Room West104A. Learn from the pros about how to get started as an author, how to handle rejection, where to look for guidance, education, and support, and what to do when you’ve started to “make it” but aren’t all the way there yet. On the panel with me are Sharon Skinner, Tom Leveen, Gini Koch, C.J. Hill, and Marcy Rockwell. 9-10pm – Create Your Own Steampunk Poem Workshop – Room 227AB. Poetry lives at the heart of Steampunk music and was a vital part of 19th century literary life. Express yourself in poetry. Free! Noon-1pm – Arizona’s Astronomical Observatories – Room 127C. Arizona features a number of world-class astronomical observatories thanks to our clear skies and high mountaintops. Learn from a panel of experts about our state’s telescope facilities, including research being done there and visitor information. On the panel with me are Karen Knierman and Gerard van Belle. 6-7pm – Strange New Worlds: Extrasolar Planets and the Kepler Mission – Room 126C. Have you ever wondered if there are solar systems other than our own? We now know there are, and with the help of NASA’s Kepler spacecraft, we’ve found hundreds of them. Join us to learn about the surprising diversity of solar systems in our galaxy. On the panel with me are Lisa Will, Gerard van Belle, David Lee Summers, Kevin Healy and Steve Desch. 10:30-11:30am – Science Fiction, Fantasy, and Horror Poetry – Room West104B. Yes, Virginia, SF poetry does exist. Join some of these poets for a look at the field. On the panel with me are Sharon Skinner, Marcy Rockwell, and Larry Hammer. 1:30-2:30pm – Ask the Astronomers – Room 127C. Do you have any astronomy questions? Now is the time to ask! Join a panel of professional astronomers/astrophysicists for a free-flowing Q&A session about the universe. Kids and adults alike are encouraged to attend and ask questions. On the panel with me are David Williams, Patrick Young, Karen Knierman, Kevin Healy, Kenneth Wong, Lisa Will, and Stefan O’Dougherty. When I’m not on one of these exciting panels, look for me at Booth 2532. I look forward to seeing you there!